Built in the years 1941 and 1942 it was designed as a base for the Shadow Factory for the well-known Rover Car company. 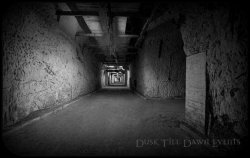 The British Government made some parts of the tunnels into top secret areas during the 1960’s on the chance that should a Nuclear War happen, then the British Government would be safe to operate the country from within there. In the year 1993 the Ministry of Defence decided that the tunnels would no longer be required as a base and the whole of the complex was then sold. There have been some documented deaths at the tunnels and many tragic accidents happened during the building period. Six men and one woman lost their lives whilst working here, some tragically lost their lives in tunnel 1 where the roof collapsed upon them and others were crushed by falling rock. Sadly, the woman was hit by a passing truck whilst just outside the tunnel system. 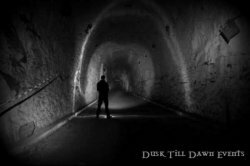 Many apparitions are reported to have been seen here, and Dusk Till Dawn Events actually witnessed seeing the ghostly figure of a man whilst holding a vigil in the depths of the 1940’s tunnel in 2018. He was seen just walking past the group of attendees and as he past by his face lit up so we could all see him quite clearly! Strange green lights are also witnessed frequently here, there move upon response to questions asked and have been known to come very close to visitors that are brave enough to stand alone in the darkness. This place is alive with activity such as heavy breaths and people feeling as if they have been touched on many many occasions. This is a vast and scary location, where darkness seems to consume you, don’t forget your torches!